Entering its tenth year of fundraising, the game industry charity is expanding its scope beyond providing toys and games to children in hospitals. Child's Play Charity announced today that the charity has selected ten domestic violence facilities for a pilot program to expand the reach of the charity. Since 2003, Child's Play has raised money to provide toys and games to children in hospitals. At the Penny Arcade Expo East in 2012, Mike Krahulik and Jerry Holkins of Penny Arcade announced that work had begun to broaden the charity to include domestic violence shelters. Unlike hospitals, these shelters are smaller and face challenges like keeping the location anonymous in order to protect those seeking help. Child's Play program coordinator and developer Jamie Dillion shared today the custom gaming cabinet developed over the last year for use in these shelters. 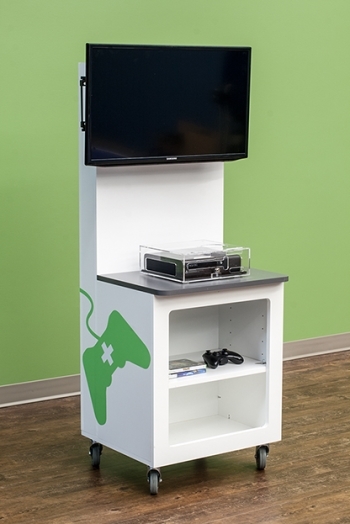 The self-contained kiosk comes with a television, console, and games. In the announcement, Dillion says, "Within our pilot program, we have domestic violence facilities that provide emergency housing, long term housing, counseling, legal advocacy, and a variety of youth and family care programs, but there was one unifying factor to each and every one: They're in need of ways to support, entertain, distract and interact with traumatised youth." After the pilot project, Child's Play has plans for the game kiosk. "As we get feedback and fine-tune the manufacturing and distribution process, we will expand the network to include facilities nationwide," says Dillion. Mike Krahulik and Jerry Holkins of the web comic Penny Arcade founded Child's Play in 2003. In 2012, the charity raised over $5 million for hospitals all over the world. Events like Desert Bus for Hope from the Loading Ready Run comedy troupe and other gaming marathons raise money for Child's Play. The official fundraising drive for 2013 began November 1, but fundraising also happens throughout the year.